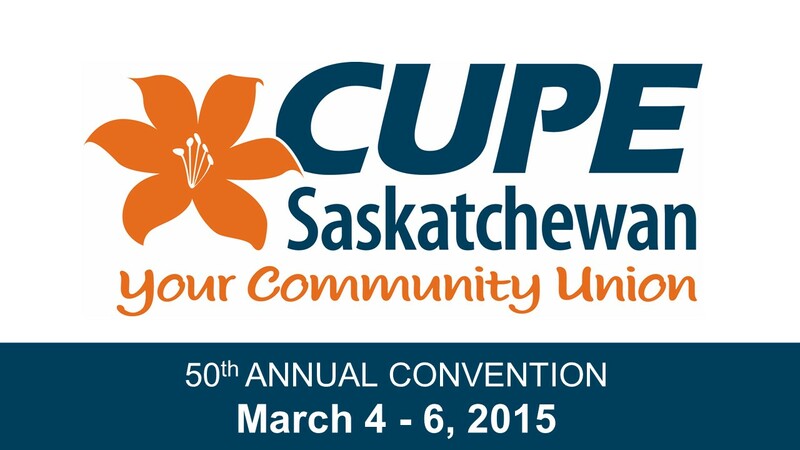 CUPE Saskatchewan welcomed over 250 registered delegates and guests to its 50th Annual Convention held on March 4 – 6, 2015 in Regina. The following are highlights of the proceedings. For over 50 years, CUPE Saskatchewan has united CUPE locals to advance fairness and defend the public services that make our communities great places to live. In his opening remarks, Tom President, President of CUPE Saskatchewan, spoke about the high price Saskatchewan people are paying for the provincial government’s privatization agenda – pointing to the outright privatization of health care laundry and the aggressive expansion of public-private partnerships (P3s). In addition to receiving reports on the activities of CUPE Saskatchewan and the work of the union at a provincial and national level, delegates were provided presentations on issues impacting CUPE members and heard from an exciting line up of guest speakers who shared their thought-provoking insights on building a more progressive, fair and inclusive Canada in which a strong and active union movement plays a vital role. Sister Rosalinda (Rose) Nartates informed delegates about the ongoing struggle in the Philippines to secure dignity and workplace standards through unionization, and brought greetings of international solidarity from the Confederation for Unity, Recognition and Advancement for Government Employees (COURAGE). Setting the direction and work of CUPE Saskatchewan for the year ahead, delegates debated and passed 28 resolutions and forwarded several additional resolutions to the Executive Board for consideration. Delegates resolved to challenge the privatization of public services, defend the constitutional rights of workers, and call for a renewed health accord to prevent future cuts to Saskatchewan’s share of federal health care funding. Many other resolutions passed continue the union’s efforts to advance equality and fairness in the workplace and in the community. During elections held at convention, JACKIE CHRISTIANSON (3766) was elected to serve as Vice-President, and MARCIA RAY (5512) was elected to serve as Recording Secretary. PATRICIA GAUSMAN (4875) was re-elected to serve as one of three Trustees. Elections for member positions on the Executive Board and by-elections to fill vacant positions on Standing Committees were also held at convention. 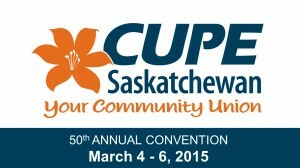 Members of CUPE Saskatchewan’s Executive Board are elected in alternating years from their respective caucus.